The apartment, located in a historic complex in the hills of Florence, has been recently renovated. And 'the outbuilding of a historic Florentine villa of the' 400, with separate access on the ground floor of the villa on the beautiful garden entrance. The view is truly unique, with views of the Duomo and the city. Overall, in addition to the main villa and another upstairs apartment with separate access, they are the private chapel, the park, a rooftop garden on the back of the Villa with a masonry house "suitable for children" and a lemon, the olive grove and a grove. 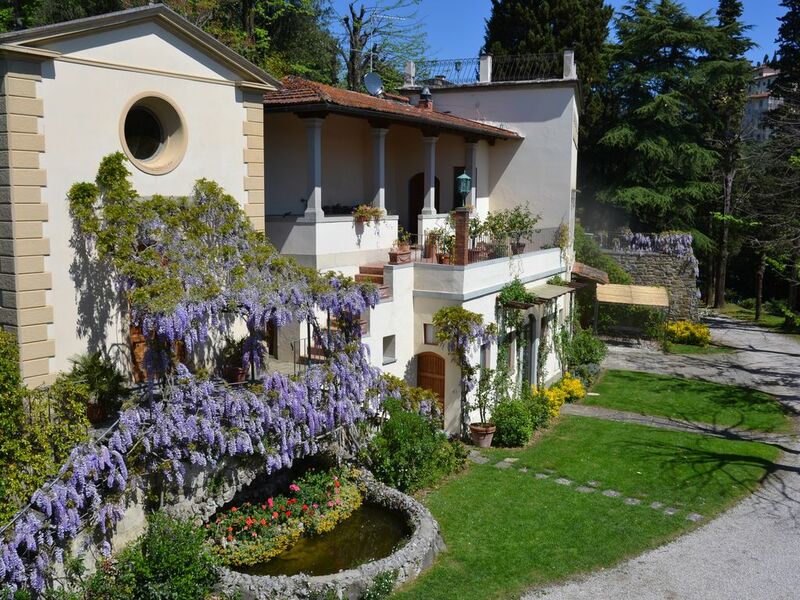 All in perfect Tuscan style, surrounded by greenery and tranquility of the Tuscan hill, yet just 3 km from the center of Florence can be reached in ten minutes. The center of Florence can be easily reached by public transport in about 15 minutes (line n ° 25) that stops near the gate of the villa. Nearby, in the small square of La Lastra, there are bar, Post Office, Food and Service Station. The apartment consists of an entrance-hall with kitchen, a double bedroom with bathroom, a double bedroom with a loft where two other beds are located, hall with bathroom, laundry and pantry. The apartment is equipped with TV, washing machine and dryer, dishwasher, oven and microwave, refrigerator with freezer, Internet connection and Wifi, air conditioning and alarm system. And 'particularly cool in summer and warm in winter. E 'available parking space in the driveway, protected from the entrance gate. Our family of four stayed here in early July. The apartment was well appointed with all of the comforts of home. Everything was as pictured and described on vrbo. It was absolutely spotlessly clean and a great place to spend the final seven days of our three week stay in Italy. The air conditioning was a life saver as it was very warm in Florence during our stay. The apartment is located not far from a bus stop. This bus takes you to San Marco Plaza where the sites of Venice are only a five minute walk away. We had a rental car but chose to take the bus and avoid the traffic of a busy city and parking fees. Anne's mother Doreen was an absolute delight. She took us to the grocery store the first day we arrived so we could get the items we needed. Doreen was always on hand to help answer any and all questions we had. She is the epitome of truly a warm and gracious hostess. This is a great place to rent and would not hesitate to recommend it to anyone! Per soggiorno superiori a 30 giorni, secondo la Legge italiana, presso l'Agenzia delle Entrate dovrà essere firmato un contratto da registrare e chiesto Codice Fiscale da scrivere sul contratto. Presso la casa è presente un cane, pastore tedesco.